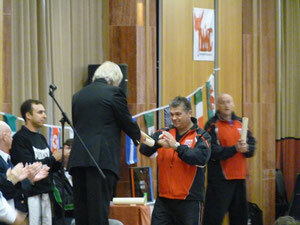 2010’s WKC World Championships took place in Albufeira, Portugal and ran from the 30th October to 2nd November. This year the BCKA was represented by 15 fighters who had all fought for their place in the WKC England Team earlier this year. These fighters had been in hard training for many months prior to the tournament, some carrying injuries and others having to drop and keep an eye on weights – these fighters make a lot of sacrifices to be able to attend and perform to their best in these tournaments. And so with all training and preparations completed, the team assembled on Friday 29th October at Birmingham Airport for an early morning flight. There was a mixture of excitement and nerves amongst the team as they checked in and waited to board. For some this was a new experience and others had been and experienced it all before. But everybody was looking forward to the challenge that lay ahead. After a comfortable flight, a quick journey followed to this year’s venue which was the Grande Real Santa Eulalia Resort & Hotel. Upon arrival here Team England were immediately ushered downstairs for registration and weigh in without so much as a quick look round their new home for the week. Registration was a quick and painless experience with the team making their designated weight categories and picking up various certificates and programmes. Before anybody could wander off, the team were called for the official WKC team photograph around the swimming pool. Shortly after this the BCKA team had their photograph taken separately with the view of the beach and shimmering Atlantic Ocean behind. Once all the photos were done the team checked in to their rooms and apartments, freshened up and set to explore the resort or in the case of some met for a few soft drinks (fighters) and alcoholic beverages (spectators). 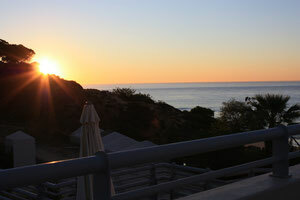 It was a nice warm afternoon on the Algarve, certainly much nicer than the weather back in England. As usual on days before the start of a tournament the time was spent relaxing and an early night was on the cards. Saturday morning saw an early start with the Opening Ceremony. All fighters dressed in their WKC tracksuits met in the lobby and soon nation by nation entered the arena behind their flag. This year more nations were represented at the championships showing the growth of the WKC as an organisation. After a few short speeches, introduction and recognition of the referees and a minute’s silence for the loss of an Irish fighter, the opening ceremony was nearly over. It was at this point that our chief instructor Alex Barrowman was presented with his seventh degree black belt to rapturous applause. This was a great honour for Alex and richly deserved following the amount of years service he has contributed to the sport and the level and array of skill he has in both fighting and martial arts. 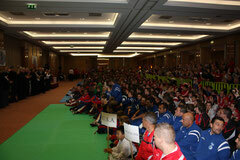 The opening ceremony came to an end which marked the tournament open. The format was the same as last year with the last day of the championships reserved for finals and elimination rounds of all categories spread over the first three days. Day one consisted of men’s and women’s light contact and girl’s points fighting. In action for the BCKA today were Nicola Gemmill, Cat Harris, Jo Redman and Kevin Williams. Nicola Gemmill kicked things off for the BCKA. Now over the last few years Nicola has built herself up a good, strong reputation within the BCKA. She trains at Corby and is very quiet and reserved, not at all the kind of person you would picture being the mean fighting machine that she is. Nicola was straight into the semi final up against a girl from Canada. The fight was closely fought in normal time and there was a bit of controversy as Nicola was not awarded a point just as time was called which would have levelled the fight. After some remonstration with the referee and officials, extra time was called and Nicola was unfortunate to lose this by 3 points and equalled her result from last year of a bronze medal. Cat Harris, a fighter from Rushden, was next up in the women’s light contact. This was Cat’s first world championships and she was set to fight in both light contact and points fighting. Cat had experience some success over the year with a win in the Irish Open to her name. Today she lined up in the semi final against a member of Team USA. Despite fighting hard over the two 2 minute rounds, Cat was unable to progress through to the final but gained a bronze medal. The last to fight in the women’s light contact was Jo Redman. Before coming into this world championships Jo had had some difficulties with injuries and had in fact only had three weeks training after a month of complete rest. Nevertheless this was a world championship and Jo put everything into her performances. She first fought an Italian opponent landing some eye catching head kicks and eased past into the semi final. Here Jo came up against an Irish competitor and it is fair to say that Jo made light work of this fight with a combination of head kicks and hand combos. Jo had made it through to Tuesday’s final which bettered her result from last year’s event. Last to fight on the first day of the championships was Kevin Williams in the men’s light contact. Kevin Williams needs no introduction in the BCKA, renowned for his points fighting abilities, speed and coaching skills. Following from his double bronze medal wins in last year’s tournament, Kevin once again entered himself into the light contact event. First up against an Irish opponent, Kevin controlled the fight from the start, making use of his speed and handwork. Needless to say Kevin progressed to the semi final coming up against England’s Ian Hollett who won the category last year. He put in an awesome performance, landing some amazing shots and putting pressure on his opponent throughout the fight, however was not able to do enough to win the fight. Another bronze medal was secured for his efforts. 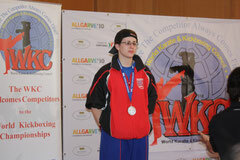 So at the end of day one’s fighting, the BCKA had three bronze medals and a fighter in Tuesday’s finals. A wonderful start to the tournament. The second day of fighting saw men and women’s points fighting and boy’s light contact. This meant that the majority of the BCKA team were in action today – Kieren Wilson, Reece Dalton, Daniel Balch, Cat Harris, Lee Murray, Richard Faller, Kevin Williams, Richie Wooton, Barry Kang, Alex Barrowman and Ryan Winham. Kieren Wilson one of 2010’s breakthrough fighters had entered both light contact and points fighting categories. 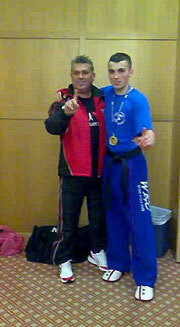 Kieren trains in Corby under Alex Barrowman and not only was this his first world championships but also his first international fighting experience. Today Kieren was competing in the boy’s light contact. 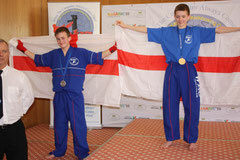 As there were too many English fighters in his category Kieren found he had to fight off against a fellow England team mate to earn his place. This was not a problem as Kieren proved himself to be better on the attack and when moving backwards than his opponent and wrapped the victory up over the two minute round. Next he came up against a member of Team Canada who although put up a good fight could not deal with Kieren’s movement and hand speed. 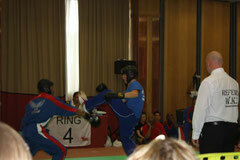 Kieren progressed through to the semi final where he faced another England team mate. Unfortunately some early exchanges led to Kieren picking up an injury to his neck which forced him to retire from the fight. Despite this Kieren had gained a bronze medal. Also fighting in the boy’s light contact was Reece Dalton. Reece from Grimsby trains in the Lincolnshire area. Reece is a fighter with good technical ability and a bright future ahead of him if he keeps training. His opponent was an experienced fighter from the USA and despite giving everything Reece did not get the decision. Back in action after yesterday’s fighting was Cat Harris, this time featuring in the women’s points fighting. Cat was drawn against a Team Canada fighter and even with her best efforts was unable to progress further than the first round. Turning out in his first world championships in the men’s points fighting was Lee Murray. Lee trains in Corby and is a popular member of the team due to his friendly, humorous nature. In a strong category, Lee found himself fighting a member of Team USA. He took a while to get going but managed to level the fight at one point, however this time it was just not meant to be. Richard Faller based in the Kettering and Corby area, faced Canadian opposition in his first fight in the men’s points fighting. In the same strong category as Lee Murray and despite putting all his effort into the fight Richard could not progress. Next up was Kevin Williams, fresh from yesterday’s fighting today in his preferred style of points fighting. Kevin first faced English opposition, which with his blurring hand speed he made quick work of winning the fight 11-1. His second fight saw him face up to a member of Team Canada, another fight Kevin won with ease 7-0. Kevin was in the semi final, up against no other than Ian Hollett his England team mate who he fought in yesterday’s light contact. Again as per yesterday’s fight in spite of landing some good shots and really testing his opponent, his campaign for the world title ended here with Kevin losing by just 2 points. Another bronze medal to his name. Also in action in the men’s points fighting was Richie Wooton. Richie had been very unlucky prior to coming to Portugal after suffering a bad knee injury which forced him out of training for several weeks and meant that he was not as fit or in as good condition as he would have liked to be. He fought a Canadian but did not progress further than the first round. Barry Kang’s world championship experience was also his first taste of international fighting. Barry trains at Kettering and is one of the taller members of the team. His opponent was also Canadian, unfortunately Barry lost the fight 5-2 but gained much experience from his participation in the tournament. Fighting in the boy’s light contact for the first time was Alex Barrowman Jnr. After much hard training and strict diet regimes Alex had managed to drop his weight category and was in the best condition ready for the tournament. His first fight was against an England team mate, a fight which Alex powered through with a display of clean precise kicks and impressive work rate. The second obstacle came in the form of Canadian opposition. This opponent was visibly rattled by Alex’s skill, fitness and power resorting to excessive contact on more than one occasion. In spite of this Alex kept his cool and relied on his ability to see him through into the semi final. Here again he faced another Canadian competitor, a guy that the BCKA team dubbed as the ‘Canadian Barry’ due to his height and resemblance to the BCKA’s Barry Kang. Although his opponent was slightly taller than him and therefore had the reach advantage, Alex cut this down keeping on top throughout the fight and landing trademark head kicks. Halfway through the fight it seemed to be a foregone conclusion that the BCKA had yet another fighter due to compete in the finals on Tuesday. Last to fight on the second day of eliminations was Ryan Winham. This year Ryan had decided he was only going to compete in the boy’s light contact. When Ryan was not fighting he could always be found behind the barriers ringside, earning him the nickname ‘Ringside Ralphy’ – one of his many nicknames. Surprisingly enough Ryan was drawn to fight yet another Canadian. This fight was closely fought with Ryan more than proving himself on the international stage. Unfortunately the decision was given in favour of the Canadian leaving Ryan very unlucky not to progress. At the end of the second day of eliminations the BCKA had gained another two bronze medals and another fighter through to the final. Monday saw day three of the WKC World Championships. Scheduled to take place on this day was the boy’s points fighting and the team events. 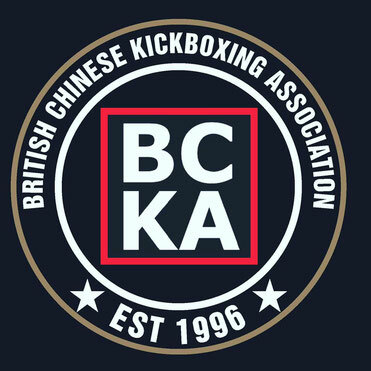 The BCKA had the following fighters in action – Lewis Gemmill, Daniel Balch, Max Halligan, Kieren Wilson, Reece Dalton and Alex Barrowman in individual categories. Alex, Nicola Gemmill and Kevin Williams were also fighting as part of their respective teams. Lewis Gemmill found he had a bye straight through to the final the next day and did not have to fight through any elimination rounds. Max Halligan was having a whirlwind 2010 after already winning the British Championships and the Irish Open on his debut in the competition. A BCKA fighter from Corby, Max’s ethic to training is to train to win and he certainly does a lot of that. In his first world championships Max lined up against a member of Team USA. Following a slow start to the fight which saw Max drop a few points, Max soon shifted up a few gears and came from 3 points down to win the fight 10-7 and go through into tomorrow’s final. Following yesterday’s light contact action, Kieren Wilson was on the mat again today in the points fighting. He first faced a Canadian, a fight he won 9-8. He then went through to the semi final coming up against a clearly experienced Team Ireland competitor. Kieren fought as hard as he could but was unable to go any further in the tournament, winning himself his second bronze medal of the tournament. Next up for the BCKA was Reece Dalton, again another who had competed in yesterday’s light contact. Today Reece was matched against an English team mate. Reece fought hard but could not overcome his opponent and his world title bid ended in the first round. Last in the individual categories was Alex Barrowman. Clearly he had not fought enough Canadians yet as he found himself facing another in the first round. Although this was a close fought fight, Alex was in the lead from the start and this never changed as the fight ended 9-7. In the semi final Alex fought an Irish competitor but a win wasn’t on the cards as the score ended 9-3 to the Irish fighter. Nevertheless Alex came away with a bronze medal for his troubles. Kevin Williams, Alex Barrowman and Nicola Gemmill all had places in the points teams. 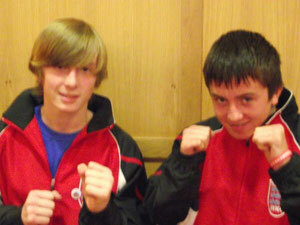 With the whole of the WKC Team England watching the three BCKA fighters had an opportunity to make an impression. Kevin and the men’s team fought an Irish team first. Kevin put in an awesome performance, showing the speed, movement and timing he is known for in the BCKA. Drawing in his opponent before striking to score his point. Kevin won his fight 9-5 and the men’s team went through to the next round. Unfortunately Kevin didn’t have another opportunity to fight as the team lost the first 3 fights to the Canadian team they faced next and left the competition just outside the medals. Nicola Gemmill was part of the girl’s points team, who lined up against the Irish girl’s team first. Nicola put in one of her trademark performances, leading in with her legs and following up with her hands. Nicola won the fight with ease 8-5, taking the girl’s points team into tomorrow’s final. Part of the boy’s points fighting team was BCKA’s Alex Barrowman. Ironically the boy’s points team first fought an Irish team and Alex faced up to the fighter from Ireland he had just fought in the individual points event earlier that day. Time for revenge… Alex put in a fine performance, seeming to thrive with the audience surrounding the mat. After seeing how to defeat this opponent, Alex threw technique after technique and won the contest with ease 10-5, seeing the team through to the next round against Team USA. Here Alex put in a stunning performance which saw his reputation rise throughout the WKC. Sublime movement, fast hand attacks, precise head kicks not to mention THAT jump kick demolished his American opponent, the score ending 16-3 and leading the boy’s points team into tomorrow’s final. With the excitement of the team events over, the elimination rounds of the world championships had been completed and the BCKA had four fighters in their individual category finals and two fighters in team finals the next day and a total of seven bronze medals. Finals day was not only a day of finals but also being awarded with medals on the podium. All of the BCKA team were excited at the prospect of finals day. Well today the BCKA had 5 fighters in action. Lewis Gemmill, Max Halligan, Alex Barrowman and Jo Redman in their individual category finals; Nicola Gemmill and Alex Barrowman were also set to turn out for their team. Lewis Gemmill had been waiting the longest to fight after his bye through the elimination rounds. Here he was drawn against a fighter from England. Lewis gave the performance of his life but fell short, missing out on the world title but with a silver medal for his efforts. Next up was Max Halligan in his points fighting final. Max was up against an Irish fighter and took control of the fight from the outset. After taking the first round 5-3, there never looked any doubt as to who the eventual winner would be. More of the same followed in the second round Max looking completely assured in his movement displaying an array of skill and technique. The contest eventually finished at 10-7 with Max the new WKC World Champion. Third on BCKA’s finals programme was Jo Redman who had been waiting since Saturday for her final against Canada’s Connie Baker in the women’s light contact. Jo put in a fine performance in a close fought fight, making good use of the mat and landing some good shots. However the decision went in favour of the Canadian leaving Jo with a silver medal. Last in the individual finals for the BCKA was Alex Barrowman. Alex faced another Canadian opponent in a contest fought over two 2 minute rounds. Alex started strong and just gathered momentum from there. Alex picked up where he left off in the elimination rounds demonstrating his prowess and superiority on the mats in light contact fighting. By the end of the second round there was only one clear winner and WKC World Champion, Alex Barrowman. Rounding off the day and the championships for the BCKA were the girl’s and boy’s points fighting teams which our Nicola Gemmill and Alex Barrowman were involved in respectively. Both teams were set to face Canadian opposition. The girl’s team fought first, with our Nicola Gemmill fighting hard for the cause. Into the last fight the teams were drawn and there was a lot of controversy surrounding the end of the fight as Team Canada were awarded a point scored after time was up which drew the fight and led to Team Canada winning on points totalled from all of the five fights. Needless to say the WKC England team were appalled by this decision and passions ran high as the boy’s team stepped up to face the boy’s team from Canada. The first two fights were won easily and with Alex stepping up for the third fight, Team England looked to exact revenge in the form of a rout for what had just happened to the girl’s team. Alex led from the off, each blow he landed causing cheers from the English supporters gathered around the mat. In fact Alex made it look easy to the delight of the English supporters who were in fine voice as they chanted ‘Alex’ throughout the fight. The fight ended and the boy’s points team were the new WKC World Champions. What a day the finals day had been with 8 BCKA fighters collecting their medals and having their moment on the podium with 2 of those fighters becoming world champion. 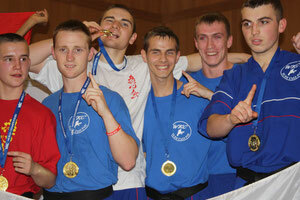 In total the BCKA came away with a haul of 13 medals – 3 gold, 3 silver and 7 bronze medals. All fighters fought extremely well and were a credit to themselves and the BCKA. The BCKA team is more than just the fighters, it is also the incomparable coaches and fantastic supporters that make the experience all the more special. And as usual the BCKA team displayed incredible support for each other on and off the mats throughout the championships. Now as the tournament drew to an end, the team had a day of relaxation and recreation on the Algarve to enjoy before heading home on the Thursday. But first a meal to celebrate the achievements of the team and wind down after all the fighting. On the ‘day off’ the BCKA team spent the day together lounging around the pool and later partaking in a (competitive) game of beach volleyball. 2010’s world championships in Portugal had been a wonderful experience for all and the team were reluctant to leave and return to England. With many in the team experiencing the world championships for the first time it proved to be a real eye opener and one set to focus the mind on training to win a world title at next year’s event.